The city bike -- shared bike, community bike, or public bicycle system (PBS) as it is variously called -- is a quite new as well as a very effective way of getting around in the city, at least as it is practiced at the leading edge . Most certainly the fastest growing form of urban transport in the world today (admittedly from a minuscule base), it is at once the darling of the media and a favorite photo op of mayors and public officials all over the world. This has lead to a situation over the last couple of years where many cities are showing great enthusiasm for the concept, without necessarily fully appreciating what is required on their part to make them into successes. As a result we are seeing far too many weak projects and weak plans in city after city around the world. But it does not have to be this way. Where to turn for solid counsel on how to plan and implement your city bike project? Certainly if you are able to dig deep into the interstices of the most successful projects – not always easy to do for a variety of reasons – there are valuable clues to be had. Beyond this however certainly one of the most solid sources of information and perspective is the leading supplier groups who have partnered with the best projects thus far to get them up and running. But how to make this contact in a positive and creative way? This turns out to be something of a challenge because in project after project we are seeing the suppliers being treated less as partners and more often as almost adversaries. It is the rare city indeed that manages to get this relationship right. Of course the suppliers are profit-making firms whose business it is to get and execute a good contract under favorable terms. But if you are a member of a city team considering a project of your own, do not lose sight of the fact that they are also your best information partners. How to bridge this gap? Here is where this new series of World Streets is hoping to step in. We have planned to carry out a cycle of in-depth interviews over the next two months with a selection of the leading suppliers active in the field worldwide, in an attempt to ask some of the questions that you may have in your pocket. We will be speaking with program leaders in Canada, France, Germany, Italy, Norway, Japan, Spain, the US, the UK, and possibly by the time we are finished one or two others as well. If you have questions you would like us to add to our list of ten for each interview, pass them on and we will see what we can do with them. And once we publish them, your comments and questions will be welcome on each profile (using the Comment link under the respective interview). Likewise if you have more general points to share with us, we invite you to Comment in the link at the end of this entry. Further Q & A: We are inviting each of the interviewees to visit the Comments section in the weeks following their posting, and, as they feel it appropriate, to give their attention to comments and questions that readers of Streets may have logged in. * For the record, one of the most valuable sources of information on this topic is the World City Bike Consortium started by the New Mobility Partnerships in 2006 as a place to share information and ask questions from people directly involved at the working level. You can consult this site freely at www.citybike.newmobility.org. Starting this week we will be publishing the first in a series of interviews with leaders of some of the main companies competing to supply public bicycle systems under contract or in partnership with cities around the world. If you turn to World Streets today (www.worldstreets.org) you will find right up top an announcement with further background on this we think quite timely interview series. As editor I have prepared a first set of questions for the interviews, but since the basis of our work is outreach and collaboration I thought it might be a good opportunity to invite questions that you would like to have us pose to one or more of our interview candidates. These you can either send on privately to editor@worldstreets.org or if you prefer to WorldCityBike@yahoogroups.com. It will then be my job to sort through them and to select several which can be added to one or more of the interviews. One of our firm positions concerning public bicycle projects from the beginning of our involvement in late 2005 has been the belief that the main source of knowledge about how to make these projects works resides in these groups. Some of this is their intellectual property and of course needs to be treated as such -- but we have found that they are often willing to share a considerable amount of information and perspective on how to make such projects succeed. I am confident that we are going to learn some valuable lessons in our conversations with them over the coming two months. So now your questions . . . I have a question - what do you mean exactly when you say supplier? 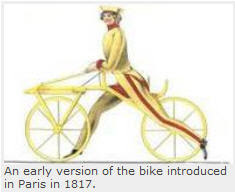 Do you mean the bike manufacturer (supplied the bikes) or the company that supplies the service to the city (i.e. in Paris JCDecaux)or is it a mix of both? One of my questions would be how they could offer a full system without ‘payment’ in advertsing rights. Many cities would just want to buy a system. One remark: the city bike is the type of bike we use in The Netherlands; one sits straight up and paddles along. A public bike are a.o. the Velib and the Bici; technically city bikes as well, but not all city bikes are public bicycles. What is there to date Eric? I like the Cambio development of car sharing - commonality between Belgium, and the 2 major operations in Prussia and Bavaria - or so it looks on the map my grandad got for good handwriting at school.... in 1903. OYBike has disposed of their first fleet after 3 years, and the new fleet has evolutionary upgrades. -What are the main ideas/objectives that you pursue via these products: CO2 reduction, energy savings, promote cycling, etc. and how do you translate them into the design of the system? for example: solar energy, a functional bike for daily brief use, minimising redistribution, etc. These are open questions, very conceptual as well. but I think they can raise important subjects that cannot be easily known in "test" questions. Of course, there will be a lot of other questions, but I would like to underline these. If you want, you can pass me the rest of the question paper, so that i can see how it is constructed and add more in the same line. Who is manufacturing the systems that lock and track the bikes?